Join in a quick Tuesday blog hop. Click any of the below buttons to get in on the Hop!!! Follow me while you are here and I follow back!!! Tell me how you are following me and I'll do the same twitter, facebook, google friend connect, networked blogs, RSS Feed,etc. Leave a comment with your blog address or tell me which number you are on the hop! 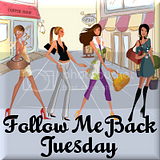 I am following you back from Follow Me Back Tuesday.Happy Tuesday. Thank you so much for linking up. Awww! You even added our buttons! you get extra points w/ me! ;) Returning your follow..happy FMBT! Yaya, J and Sarah!! I'm following all 3 of you!! Thanks so much! Thanks for stopping by my site and following me! I am now your newest follower. Thanks for stopping by! I'm following you back and I'm also following on twitter and facebook! Thanks for linking up for FMBT. I am our newest follower. Have a great week !! Following you from FMBT - hope to see you at Dropped Stitches. Following you back! Thanks for the follow! Thanks for stopping by All of It and Nothing at All! Thank you for this list as well. I'm going to check them out! Melissa, Deanna and Kim thanks so much for stopping and following me!!! I'm on my way right now to visit YOUUUUU and follow back!!!! Stacyeee, Kristen and Erin thanks so much for the FOLLOW and visit!!!! I'm on my way to visit and following you right now!!! whoohoo! New New New to all this! Gooseberry Patch serves up a Mexican Fiesta! National Eat your Veggies Day! You're Not the Boss of Me- great summer reading! CSN Stores $40 Gift card giveaway! Got Paint? Gidden free paint offer is hot!